Becky Ruby Swansburg is Chief Marketing Officer for Stonewood Financial. Becky has more than a decade of experience in marketing, public relations and communications across a range of industries in the for-profit, non-profit and government sectors. Becky joined Stonewood in 2012 to lead the development of consumer stories that show the value of IUL to clients. At Stonewood, Becky oversees the creation of comprehensive, coordinated IUL resources that take a client from "nice to meet you" to "nice doing business with you." Prior to joining Stonewood, Becky served as Director of Communication and Public Affairs for Greater Louisville Inc. – The Metro Chamber of Commerce, where she directed the chamber’s communications and government relations. Becky has also handled marketing and communications for several U.S. Congressmen and government agencies, and has worked in the White House Press Office in Washington, D.C.
Becky holds a B.S. in Political Science from Middlebury College and an M.S. in Public Relations from Boston University. 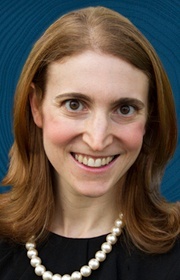 An active community member, she serves on the Board of Directors for the Jewish Community of Louisville and the Jewish Community Relations Council. Becky is co-founder of Lean In Louisville, and has prior service on the Board of Directors for the National Association of Women Business Owners (NAWBO) Louisville, the Kentucky Chamber of Commerce Executives, and the Rauch Planetarium at the University of Louisville. Becky was named to Business First’s prestigious ‘Forty Under 40’ list of community leaders, and is a Bingham Fellow through the Leadership Louisville Center.